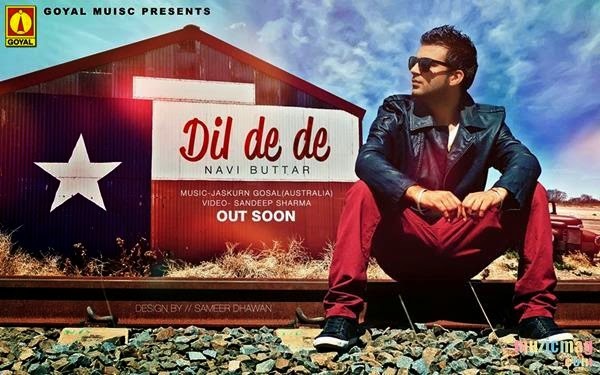 Jaskurn Gosal - First Main Stream Bhangra Music Producer from Australia comes with his next song on Goyal Music titled 'Dil De De' sung by very talented Navi Buttar. Jaskurn Gosal is First Main Stream Bhangra Music Producer from Australia who rose to fame with 'Haan Balliye Ft Bunzy Mack and AS Amar. Recenly he did a track with Preet Harpal titled 'Parhdi Hundi Si' and also audience is waiting for his collaboration with Harjot in 'Pendu'. Video of the song is shot by Sandeep Sharma - The Man behind a tonnes of big Hit Music Videos such as Lancer ft Jassi Gill, Look Lak - Roshan Prince, Aaja Veh Ft Harbhajan Shera, Mukhtar Sahota, Izhaar Ft Harjot, Mehsoos - Manmohan Waris, Tareyan Di Loye - Nachhatar Gill & Facebook - Kamal Heer etc. ! The artwork is done by Sameer Dhawan.